But the parents are drawn by something else as well. They know that in Candor their obstreperous teenagers will somehow become rewired - they'll learn to respect their elders, to do their chores, and enjoy their homework. They'll give up the tattoos, metal music, and partying that have been driving their parents crazy. They'll become every parent's dream. It seems fitting to be writing about a dystopian novel on the 4th of July. I appreciate some good irony, and this one doesn't escape me. The 4th is about celebrating letting freedom ring, and dystopian is about usually about taking that to the next level--freedom rang so much someone had to step in and take it away before the population destroyed itself. This book, as I thought it would, reminded me of the movie Disturbing Behavior. Candor put a new spin on it, though. 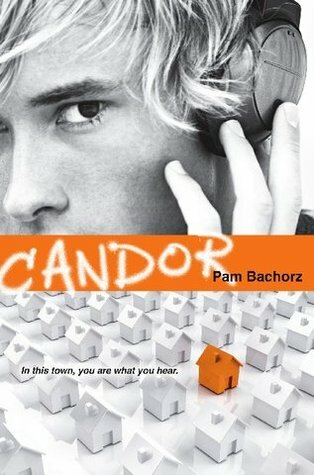 The residents of the town of Candor are brainwashed by Messages that filter through a constant stream of always-playing music that filters through speakers everywhere in their town. The Messages are sometimes generic in nature--Always obey your parents--to tailor-made messages for some kids--Sherman Golub is your destiny. (Yep. The Messages can even make you fall in love with someone.) As our main character Oscar is quick to tell us, if you go too long without hearing the Messages once you've started hearing them, your brain will unravel and you won't get de-brainwashed--you'll go insane and kill yourself. Oscar's father is the town founder, the leader, the one who creates the Messages and programs them for people. And for the special cases, he built what Oscar calls the Listening Room: a padded cell with speakers designed to blast your brain with Messages 24/7 until you conform. When we meet Oscar, he tells us how over the years he learned to build walls in his mind to fight the Messages, and how he's created a business getting kids with enough money out of Candor. He is abrasive and rude, often referring to women in a horribly derogatory fashion that made me almost stop reading on several occasions. It may be typical teenage boy stuff, but I still found it distasteful, and it didn't seem to help the book in any way. The town appears to be programmed to think Oscar is a celebrity, and even though he thinks for himself, it also seems to have gone to his head. I thought his appreciation for Nia--a girl who seems to fight the Messages all on her own--was well-developed, though, and over the course of the story I did come to like him. Oscar's wild-child girlfriend had her moments for me. I liked her, but I found her pretty bland. I didn't really understand what she saw in Oscar. I'd like to say more about her, but she really didn't have much story to her and she really was there for Oscar to have his transformation. The author really drilled home what a disgusting, oily, nasty, blubbery, revolting slob Sherman Golub was. He almost seemed cartoonish in the way she described him, and at times the imagery made me want to retch. And yet I really felt sorry for him, and I found myself thinking Candor might not be such a bad place for someone like him--and yet he was the person Oscar was trying to help free. It made me sad. Sherman needed the most help, and he was the one not getting it. Mandi was Oscar's girlfriend in the beginning. She had been a beauty pagent queen until she had tortured some girl into committing suicide, and then her parents had moved to Candor. And I loved her. The author did a great job at showing Mandi's constant war with herself, struggling between her cruel nature and the perfect drone Candor had shaped her into. I honestly liked Mandi the most out of all of the characters, and I felt the most sorry for her when the former beauty queen was forced into loving Sherman. It made me sick. Especially when Mandi did everything she could to take care of him, even though she was clearly disgusted by him. Overall I really enjoyed the story. It was not a quick read, and there were parts I found irritating (like Oscar's brutish behavior and borderline cruelty when it came to choosing his clients--those with the most money got out). I think it would have been better if Oscar were secretly choosing his clients based on who had the best chances of survival, who was the best connected, etc. Even if it had a selfish element then, it wouldn't have been about saving the least worthy of all of them just because they had money. And I didn't like his fixation with... the female form, shall we say? Maybe boys think like that--I just didn't really want to read about it. But that's a personal preference. What I did enjoy was Oscar's back story. A father who created the perfect town to erase every bad thing in everyone's lives--after the death of his son. A mother who ran away when she realized what her husband was doing. That's definitely an element I wish had been explored. There's a line in the novel where Oscar overhears his parents arguing before his mother leaves and his father says, "Who's more important? The son who died? Or the one who's still alive?" I liked the hidden motivation it spoke of, but it's never touched on again. And I couldn't help feeling Oscar's father knew Oscar was the one acting out in the town, but he pretended he didn't know because he wanted Oscar to be like him some day--above the Messages. But that isn't what happened, and it didn't seem like the father we caught glimpses of. The Listening Room wasn't built up the way I think it could have been (like Unwinding in Unwind!). But it was frightening. And the book ends on an eerie note that will haunt you even after the book is over.